On Wednesday (27/12/201 &) Google Doodle featured a blond woman in the middle of the stage with a blue background. She is Marlene Dietrich, a Berlin-born film actress, Germany, 116 years ago. Marlene Dietrich, whose full name is Maria Magdalene Dietrich is known for her diligent performance on the big screen in Hollywood's golden age. Marlene Dietrich's career skyrocketed into the international scene after starring in the first German-language film, Der Blaue Engel, released in 1930. He then went to the United States and was instrumental in a number of famous films, including Morocco, Shanghai Express, and The Devil is a Woman. In Morocco, Marlene Dietrich seemed to challenge the image of feminism at the time, wearing tuxedo and top hat as a costume while acting as a cabaret singer. His appearance in Morocco was used by Google artist, Sasha Steinberg, as the design of Google Doodle, according to a description on the Google page, as summarized by KompasTekno. During the turbulent World War II, Marlene Dietrich, who in 1939 became a United States citizen against Nazism and rejected the offer of a movie from the regime of Adolf Hitler's leadership. He was then involved in anti-Nazi propaganda efforts. The films are banned in Germany. Marlene Dietrich concluded on May 6, 1992 in a flat in Paris, France, at the age of 90. His funeral was attended by about 1,500 people, including German, Russian, US, British and other countries ambassadors. 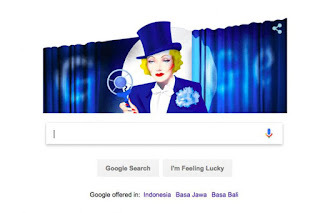 0 Response to "Get Marlene Dietrich So Google Doodle Today"